On August 15th instructions were received from HQ. 54th Divn. that the 162nd Bde shall cooperate with the 10th Divn, in an attack [unreadable] TURKISH position - the intention being that the 10th Divn. should seize the line 136.V.5 to Pt. 103 in 136.L - the 162nd Brigade watching he right flank of the 10th Divn. and moving via 118A, 136V and against KIDNEY HILL. The Bde on reaching KIDNEY HILL to face East and link up with the 161st Brigade on the right. The Brigade was ordered to rendezvous at 1300 on the right of the IRISH FUSILIERS trenches i.e. on the extreme right of the 10th Divn. The Brigadier 162nd Brigade directed the 1/5 Bn. BEDF R. to cooperate with the advance of the 10th Irish Divn and to provide a right flank guard the 1/10 LOND. R. being directed to move in echelon on the right flank of the 1/5 BEDF. R. being followed by the 1/11 LOND. R.
Communication with the 10th Divn. was not obtained in the first instance as it was understood from the orders of that Divn. that the IRISH FUSILIERS on the right was the unit with whom touch would be kept. In reality the right hand unit of the 10th Divn. to advance was at least half a mile away further north on the left. Owing to this misunderstanding the advance of the 1/5th Bn. BEDF. R. with the 10th Divn. was not at first well coordinated. The advance of the 1/5 Bedf. R met with no opposition until the line 136 to 4-7 [?] and as two of the coys of that unit had actually delayed their advance and had moved off too far to the right flank it was found necessary to reinforce the 2 leading coys of the BEDF. R with two coys of the 1/10 Lond. R. The left of the line was unable to progress and was reinforced by the remaining 2 coys of the 1/10 LOND. R. on the line 136.5.7 [?] - 118.A.1 - the remaining 2 coys of the BEDF. R. having in the meantime joined their unit on the right. At this stage urgent requests came from the G.O.C. 10th Divn. for the advance of the 162nd Bde. to [unreadable] greater cooperation and as the response for a more rapid advance was not apparently [unreadable] the Brigadier reinforced the line with 2 coys of the 1/11 LOND. R.
In response to a further application from the G.O.C. 10th Divn. for a greater rapidity of advance - the Brigadier accompanied by Lt-Col Byrne [?] 1/11 LOND. R. and the Brigade Major - went up to the advanced lines of troops a [unreadable] being evidently necessary - especially on the left of the line. The heavy fire encountered checked the advance and the line fell back considerably disorganised. Brigadier de Winton was wounded whilst leading forward the troops. It was found desirable to delay the advance of the left portion of the line until the troops became somewhat more organised. In the meantime the right half of the line was making some progress under Lt-Col. BRIGHTEN 1/5 BEDF. R. although suffering considerable casualties. At this stage about 1700 Brig. Gen. de WINTON owing to his wound had to give up command of the Bde and messages to that effect were sent by the Brigade Major to Lt. Col. BYRNE 1/11 LOND. 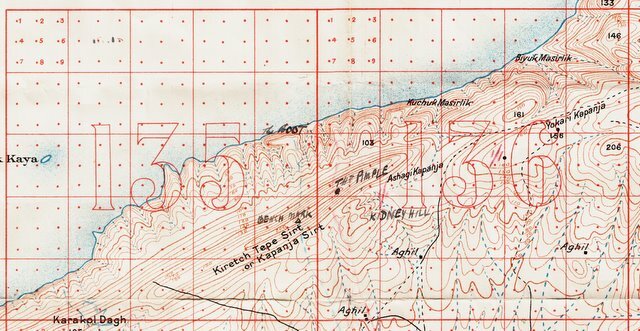 R. It was now found possible to lead forward the troops on the left front and after considerable opposition, KIDNEY HILL was occupied by their [unreadable]. Arrangements were at once made for its defence which were not too well advanced when darkness came on. Good use however was made of existing TURKISH trenches. The Brigade Major who had accompanied the advance of the left portion of the line decided to leave KIDNEY HILL in charge of Major DAVIS 1/11 LOND. R. and of Capt. COWLEY 1/10 LOND. R. and to endeavour to return to Bde. HQ. 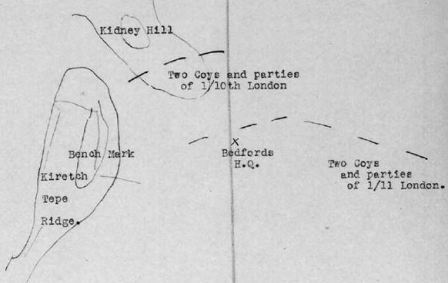 as all communications had been lost and the update as to the capture of KIDNEY HILL was important - also because he was uncertain as to the command not knowing whether Lt Col BYRNE had been in a position to take it up. He reached Bn HQ. at about 2200. At about 2100 Capt. COWLEY 1/10 LOND. R. reported to Bde. HQ. that having been surrounded by large numbers of the enemy they had been obliged to evacuate KIDNEY HILL and had fallen back upon the line 136.V.1 to 136.V.4.9. During this time the right portion of the attack under Lt. Col. BRIGHTEN 1/5 BEDF. R. having seized the line 136.V.4 to 118.A.4 proceeded to entrench and consolidate the ground gained. The general line held by the Bde. on the conclusion of operations on the night August 15/16 was 136.V.1 to 118.A.4. Other Ranks - killed, wounded and missing (approx) 900. I would submit the names of the following officers and NCO's for services during these operations. The usual fusillade during the night and early morning but nothing serious happened. A hot, close morning, but a breeze sprang up about 8 o'clock. At that hour I got hold of Brighten [comment; Lieutenant Colonel Edgar William Brighten, C.O. 5th Bedfordshires] and we walked up to Divl. HQ to get some news. On arriving at Inglefield's dug out, he came out and said "There is a job for your Brigade today. You are to be lent to the 10th Divn. for a special operation." I proceeded at once to the 10th Divn. HQ and found Sir Bryan Mahon and his staff, and received verbal orders (written ones arrived at 4.30). Mahon was in a very bad temper and received me most rudely, gave me little or no information, spoke disparagingly of the artillery support, said the "sausage balloon was no damned use", and seemed generally fed up with the whole thing. His staff were more helpful, and I came away with a pretty clear idea as to what was wanted of me. The 10th Divn. (except the right battn.) was to make a frontal attack on what I named Kidney Hill (on account of its appearance on the map) and my brigade was to advance at the same time through the R.I. Fusiliers to protect the right flank of the attack and if necessary to assault Kidney Hill from that flank if the 10th Divn. could not take it. My secondary job was to fill any gaps in the line on my right. I returned to my H.Q. at about 10 a.m. At noon I assembled the Bn. CO's (3 battns. only, as the Northamptons had not then been landed), explained the operations and gave orders. The Bedfords were to lead, the 10/Londons to follow in echelon on the right, and the 11/Londons in reserve. The attack was to commence at 1 p.m. and at that hour the leading company of the Bedfords went over the parapet. My first HQ. was established at the point marked in a trench occupied by a company of the Royal Irish Fusiliers and at that point I was interviewed by Captain Bernard (Rifle Bde.) a staff officer of the 10th Divn. We were under fire the whole time and the air was humming with bullets. I was in telephone communication with the 10th Divn. and received constant messages from them. The battn. of that Divn. seemed to have been checked in their advance pretty soon. The Bedfords were advancing somewhat slowly and I urged more push and Hay (my Bde. Major) went forward to one company commander to say I wanted more rapidity. At about 3 p.m. I received a message from the 10th Divn. that their attack was held up and needed our assistance. I ordered the 10/Londons to move forward, but owing to the configuration of the ground they were not visible to me. At 4 p.m. I moved my HQ. to a point marked R on my map, leaving Hay to bring on the 11/Londons. I and my party were sniped at the whole way, and one of my signallers was hit. To my annoyance, I found several groups of Bedfords sheltering behind rocks, bushes, etc. and personally kicked some of them up. Unquestionably at this time there was, in the area under my observation, a certain amount of reluctance to come to grips with the enemy. From R I went forward to make a personal reconnaissance, but could see very little owing to an intervening ridge with a nullah between. I could just see the top of Kidney Hill. I returned to my HQ. and ordered a company of the 11/London, which had now come up, to go forward in support and mop up all the skulkers they came across. This was about 5.15 p.m. At about 5.30 I received a message from the 10th Divn. to the effect that my people were not pressing to attack, that they could be seen lying down doing nothing and that it would be a bad business for me if they failed to get home. I turned to Hay and said "Well, there is nothing for it but to throw our last reserve in and go with it ourselves. Giving orders to the rest of the 11th Londons to move forward (less one company to hold the ridge as a rallying point), we went forward. As we topped the ridge a heavy shrapnel fire was opened on us, and about 6 p.m. I was hit in the chest by a shrapnel bullet. The shrapnel fire continued and presently a number of men came running back, whom we tried to rally but failed. Finding that no further advance could be made, I returned to my R HQ. and talked things over with Hay. Arranged for the holding of a rallying point and the supply of ammunition and got in touch with the C.O. of the 11/Londons (Bryne), who went off to rally his men. Kittoe of the 10th came up a good deal upset at what he thought was the failure of his battn. but I said "Never mind. You've done your best. We shall win through all right." (I afterwards learnt that he went off his head that night from shell shock). Soon after this my wound became very painful, and I was incapacitated and had to find my way to the dressing station, leaving Byrne in command with Hay. The last named, I afterwards heard, pulled things together and under cover of darkness continued to advance capturing a portion of the position, and taking some Turkish prisoners, but was driven out of it in the morning by a counter-attack. The brigade was officially considered "to have done well under difficult circumstances". Attached notes are forwarded in the hope that they may be of some value. (sgd) Edgar W. Brighten. Lt-Col.
1. Page 2, lines 3-6 from f.n. "while the 162nd Brigade ... assaulted Kidney Hill from the south" I do not think these were the orders as understood by Br.-General de Winton. I went with him to 10th Div. H.Q. during the forenoon of 15th August and waited outside whilst he interviewed General Mahon. On coming away, de Winton said "The 10th Division are going to attack Kidney Hill, our brigade is to protect the right flank, we are not to become 'seriously engaged'". And this was also the gist of his order given verbally to Bn. commanders as soon as we got back to the bivouac. 2. p.5. middle. "Casualties were heavy and there was no sign on the right of the 162nd Brigade" I do not understand this. My Battalion (1/5th Bedfords) leading 162nd Brigade moved forward at 1 p.m. in conjunction with troops of 10th Division who could be seen on top of the ridge. We were in line with the 10th Division when they assaulted the bench-mark and we cooperated with fire. 3. p.7. lines before f.n.2. "It was understood that the brigade ... was anticipated" This bears out my statement in para 1. 4. p.7. lines 1-3 after f.n.3. "The result of this misunderstanding was that the Bedfords waited." The Bedfords did not wait. I was told that a Staff Officer from the 10th Division would meet me to point out the right of that Division. I did meet him about 12.45 pm in the trenches of the 10th Division. I forget which battalion it was. He could not tell me which troops were going forward. At 1 pm I pointed out troops beginning to move forward on the top of the ridge and asked him if that was the right battalion of his division. He did not seem clear about it and I said well we cannot wait, I shall go at once. I pointed out the direction my battalion would go and asked him to make it clear to his brigade. We moved forward punctually at 1 pm by my watch. 6. p.8. lines before f.n. "... and that of Colonel Byrne who had now assumed command of the brigade". We regimental officers could not endorse this. After the loss of de Winton there was no brigade control whatever until dawn on 17th Aug. when the B.M. (Capt. Hay) came up to get the situation. The remnants of the brigade were at that time organised more or less as one battalion under my command. The 10th Division had, to my astonishment, withdrawn during the night, and it was news to Cap. Hay when I pointed out on the ground, where the left of my battalion had got to. He wished me to pull them back at once. I demurred, pointing out that so far we had resisted all counter attacks and if only the 10th Division would come up in line with us we should be in a much stronger position, also that we could again cooperate in any attacks to retake the bench-mark. In any case, I declined to withdraw in daylight and it was arranged that we should get definite instructions, on the situation as now shown to him, before I made any move. He came up again during the afternoon with final orders for us to withdraw, which we did reluctantly during the night 17/18th Aug. During this night also our brigade was sorted out and reorganised into separate battalions. Officers joined 1/5th Bedford Regt. 2nd Lieut H.J. Jolowitz [Herbert Felix JOLOWITZ (JOLOWICZ)] Temp.